Government talks big on transparency but…. | Accountability Round Table. Government talks big on transparency but…. Our ART members, Tim Smith, David Harper and Stephen Charles authored the following article, published in The Sydney Morning Herald and the Canberra Times. Seven years ago, the Gillard government established the Office of the Australian Information Commissioner to strengthen the openness and accountability of government. Four years later, the Abbott government tried to abolish the office by repealing its legislation. The Senate, however, was unprepared to do this. The government and Attorney-General George Brandis, who had significantly cut the office’s budget in anticipation of its abolition, did not restore its funding for its crucial freedom of information functions. 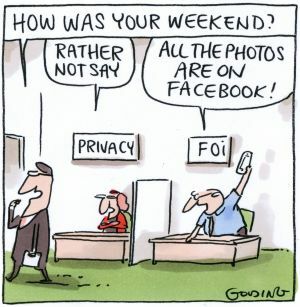 As the Auditor-General revealed recently, the office’s funding for FOI functions was halved while its privacy functions increased significantly. The government also departed significantly from the office’s legislated management structure of three independent commissioners: an information commissioner, privacy commissioner and and FOI commissioner. It adopted a policy of not replacing commissioners when they moved on, instead passing their responsibilities to a single remaining commissioner. As a result, for some time, the privacy commissioner, Timothy Pilgrim, has also been the information commissioner. He lacks the legal qualifications specified for the FOI commissioner but has been called upon to discharge the FOI functions using a power he holds as the information commissioner. There is still no FOI commissioner. This assault on open and accountable government has also involved rejecting Australia’s commitments as a participating nation in the international Open Government Partnership. Its commitments include “ambitious” action to strengthen openness and accountability. The Abbott government failed to prepare Australia’s first national action plan for the partnership, as required. Australia’s rejection of its commitments continued until late 2015, when Malcolm Turnbull become Prime Minister. In his first public statement, he spoke strongly of the importance of open and accountable government. He took immediate steps to write to the partnership to recommit Australia as a member. He also began to prepare Australia’s national action plan with civil society groups. You are not aware of this partnership? You are in good company. Australia’s membership has received scant publicity. The next development was Brandis’s announcement in the 2016 budget that the government no longer sought to abolish the information commissioner’s office and would return to it the FOI functions it had passed on to others. He did not, however, take the necessary next step: restore funding for its FOI functions and re-establish the three separate commissioners. He did, however, provide extra funding for the privacy functions. The plan also established the Attorney-General’s Department as the “lead agency” for ensuring the commitment to fund the office was upheld. So the Attorney-General remained in charge and Australia was committed to adequately resourcing the office to discharge its statutory functions. The finalised plan was lodged in December last year, when its commitments official began. But in this year’s May budget, Brandis again made no mention of restoring the offie’s FOI funding or enabling the return to the three-commissioner system. Six months later, that remains the situation. Why has the Attorney-General allowed this to continue? Why has the Prime Minister? It’s not as if what needs to be done will have any real effect on the budget; Brandis told Parliament when he initially tried to abolish the office that abolition would save about $2.5 million a year over four years. This is a drop in the budgetary bucket. In addition, serious legal questions have been raised since 2014 about whether the government’s actions breached section 61 of the constitution and the constitutional principles of the separation of powers and the rule of law. Are things about to change? The new Nick Xenophon Team senator, Rex Patrick, has placed a notice of motion to be voted on on Wednesday. It urges the government to immediately begin “the process of appointing an independent privacy commissioner and an independent FOI commissioner in accordance with the Office of the Australian Information Commissioner Act”. That is the logical and critical starting point. But for Brandis to fully address his responsibilities to the government, Australians and our Open Government Partnership commitments, he must ensure the information commissioner’s office is fully funded in the next budget. That should not be difficult if the government and civil society implement the national action plan commitments. The public interest demands nothing less. Tim Smith, David Harper and Stephen Charles are former justices of the Supreme Court of Victoria, and members of the Accountability Round Table.